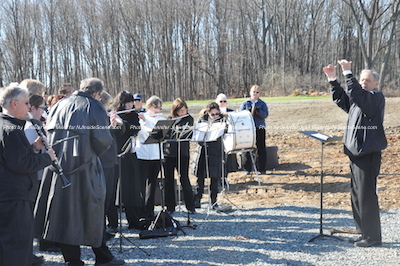 During the prayer for the dedication of the cemetery. 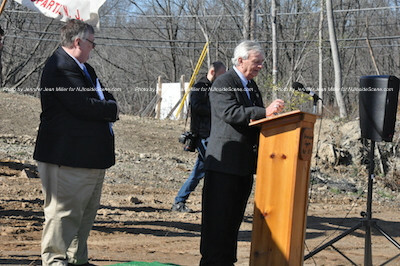 John Harrigan (far right) was the person who spearheaded the project. Photo by Jennifer Jean Miller. 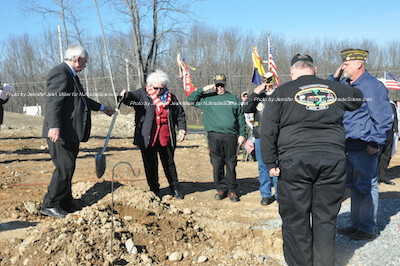 SUSSEX COUNTY, NJ – Following an arduous effort that began in 2008, the long awaited Northern New Jersey Veterans Memorial Cemetery celebrated its official opening today, Sun. Nov. 15. 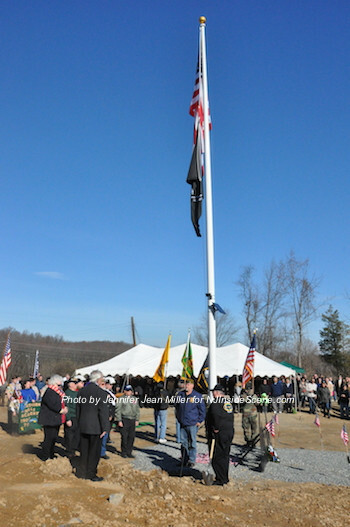 The event on the 66-acre tract, expected to be a final resting place for up to 16,000 veterans, was greeted with an enthusiastic turnout to honor veterans with hundreds of veterans, dignitaries and locals in attendance. 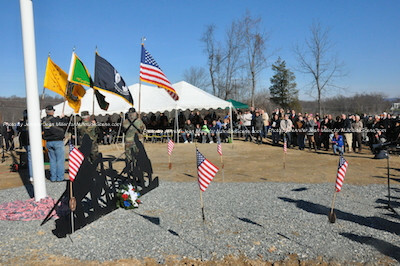 A view of the new veterans cemetery during the opening ceremony. Photo by Jennifer Jean Miller. The cemetery is located adjacent to the Sussex County Technical School on Route 94 in Sparta. The ceremony kicked off with music from community bands playing patriotic songs, with Ken Odgers conducting, followed by the prayer of invocation. Ken Odgers leads participating community bands. Photo by Jennifer Jean Miller. The prayer of invocation. Photo by Jennifer Jean Miller. 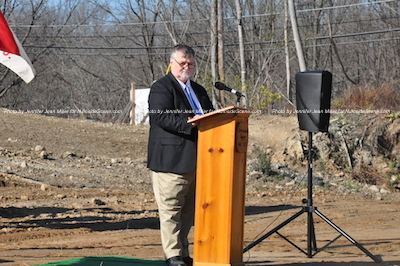 Sussex County Freeholder Director Phil Crabb was the emcee for the event, introducing all of the speakers for the day and recognizing those who contributed to bring the project to life. 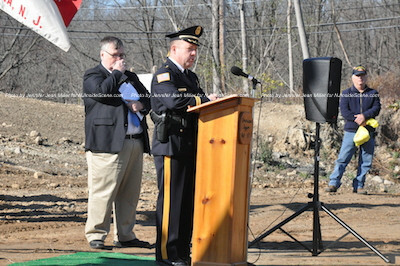 Phil Crabb, Sussex County Freeholder Director, who was the emcee at the event. Photo by Jennifer Jean Miller. 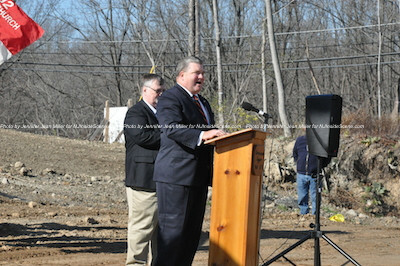 Following the blessing on the site, Senator Steve Oroho (R-24) took to the podium. He praised John Harrington of VVA Chapter 1002 for their persistence in moving forward to have a veterans cemetery in the area. Senator Steve Oroho addresses the crowd. Photo by Jennifer Jean Miller. “John Harrigan and your men and women have been an inspiration to us all,” said Oroho, who also noted the involvement of Former Assemblywoman Alison Littell McHose, Former Assemblyman Gary Chiusano and Assemblyman Parker Space. An overview of the crowd in attendance. Where the tent is located is where the main building for the cemetery will be located on the property. Photo by Jennifer Jean Miller. Oroho emphasized that the placement of the cemetery near an educational facility, which the freedoms that veterans have given to the United States, have allowed for freedom in education, and was a fitting choice. “Thank you for allowing us to be a part of what you’ve done,” Oroho concluded. 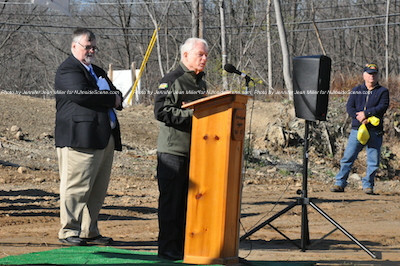 Freeholder Richard Vohden, a Korea War Veteran, talks about the start of the project. Photo by Jennifer Jean Miller. Freeholder Richard Vohden, a Korean War Veteran, said that he first met Harrigan when he was on the County Open Space Committee in 2010. He gave his thanks and appreciation to all involved, noting that the land will be a place for every veteran who has defended our way of life. Parker Space talks about the efforts of students fundraising. Photo by Jennifer Jean Miller. 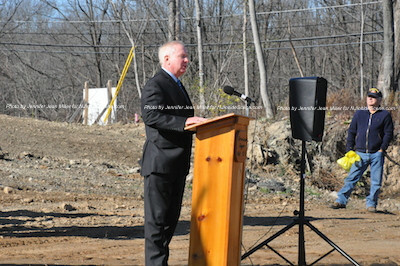 At the podium Space described the effort as “something contagious that spread as a good thing.” Space said that there were fundraising efforts from students at the nearby Sussex County Technical School, as well as other groups, that have been helping to make this a reality alongside of Harrigan. Sussex County Clerk Jeff Parrott discusses one of his career highlights as a freeholder, which was the inception of the idea of the cemetery. Photo by Jennifer Jean Miller. Originally, he said they had found a one-acre tract of land for the group by the Homestead, but that Harrigan’s vision was greater, similar to something of Arlington National Cemetery. Sheriff Michael Strada commented that he had visited Arlington National Cemetery, an experience that he described gave him chills. As a veteran himself, he said it was an opportunity to speak at today’s event. 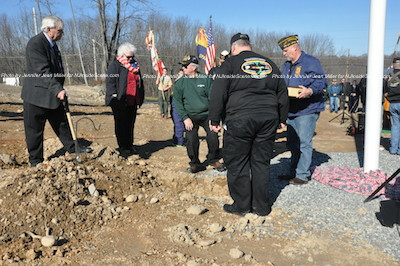 He said that he was glad Sussex County now had its own place for veterans. 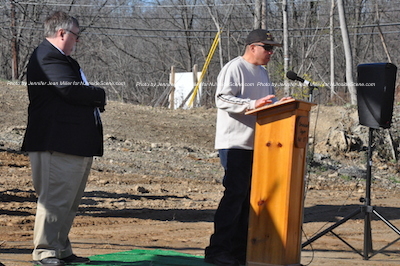 Sheriff Michael Strada, a veteran himself, praises the efforts. Photo by Jennifer Jean Miller. 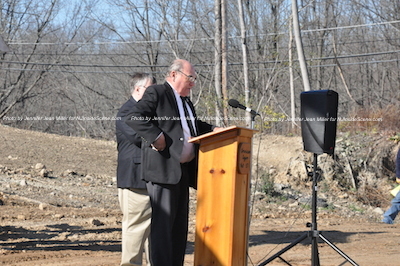 Sparta Mayor Jerry Murphy congratulates the team on their mission in the cemetery project. Photo by Jennifer Jean Miller. Harrigan, a Vietnam veteran himself, received a standing ovation when it was his turn at the podium, one that continued even after he had suggested the applauds simmer down. 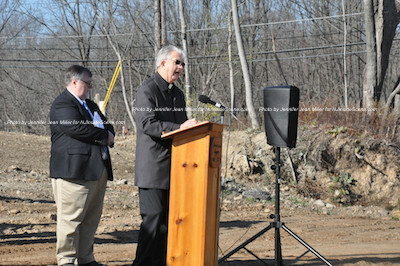 John Harrigan who has been working on the idea of the cemetery project since 2008. Photo by Jennifer Jean Miller. “What has been accomplished here was started as one individual but completed as a community,” he said. He said there were countless groups to thank for assistance, from students to church groups, to scouts to women’s groups, to the DAR (Daughters of the American Revolution). The law firm of Kelly & Ward LLC was also thanked as a group that was instrumental in the project, with attorneys Kevin Kelly and Megan Ward providing pro bono legal assistance for the project. Others recognized were Sue and Rick Gardell of Gardell Engineering, and Mulch Concept’s Mark and Michelle De Venezia. The block company, E.P. Henry was another. The conclusion of the cemetery was the burial of ashes of American Flags that were ceremoniously and properly cremated. The Sussex County Municipal Utilities Authority (SCMUA) provided the container, which was made of recycled materials, and also took care of the ashes. A uniform is first placed down in the plot by the flagpole. Photo by Jennifer Jean Miller. John Harrigan places the first mound of dirt on the plot. Photo by Jennifer Jean Miller. 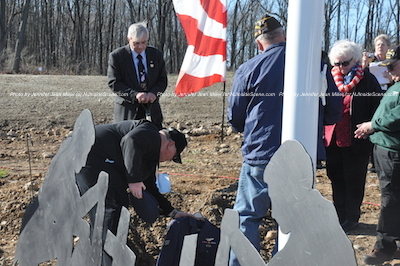 The ashes of respectfully cremated flags are placed in the plot. Photo by Jennifer Jean Miller. 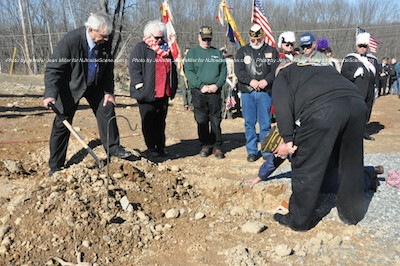 John Harrigan (far left) passes the shovel to the next member of the cemetery board. Photo by Jennifer Jean Miller. 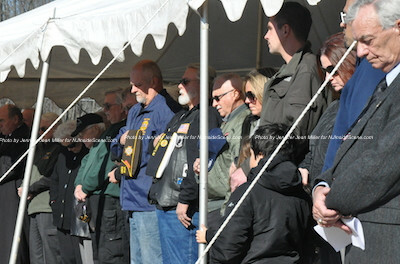 The program concluded with a benediction, gun salute and “Taps” played. 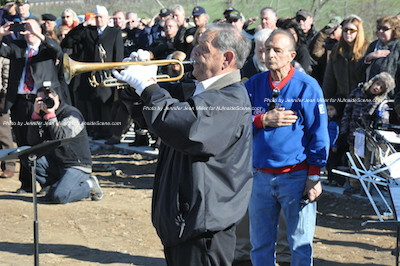 Ken Odgers plays “Taps.” Photo by Jennifer Jean Miller. There are about 100 families already who are seeking to bury the ashes and remains of loved ones in this final resting place. Like this story? 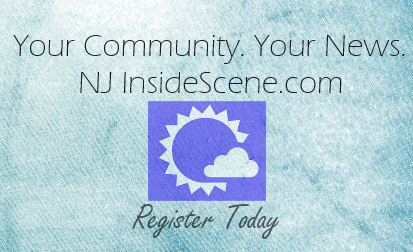 Then continue to stay on the scene with NJ Inside Scene. Click here to follow all of our stories on Facebook.